Sure this is subjective. But as a corporate trainer and coach I’ve read a lot and do a lot of Time Management training. I’ve customized my Time Management training course based on my experience and what I’ve read / studied. Because of my experience I see first-hand what time management techniques make sense to professionals, what tips people are able to adopt quickly… and what time management tips don’t work well. I often get asked what I feel are the best time management books. Even though not everything in every book will help every person, I offer you this list. Please note – they are not in a specify order. All images and names are Copyright. In Getting Things Done, David Allen shares his methods increased performance. David’s approach is one that suggests that when we are calm and organized our productivity and creativity goes up. I agree; being mindful of our goals lets us prioritize what we do and when we do it. In The 7 Habits Of Highly Effective People, the late Stephen R. Covey shares his 7 steps. Without doubt it’s my most highlighted, underlined and used time management book. Stephen goes beyond Time Management and indirectly gets into how to be a good people manager and leader. In The Now Habit, Dr. Neil Fiore looks at the impact of procrastination. It’s one of the biggest challenges I see / hear of when I deliver time management training. Dr. Fiore shares the good and bad impact of procrastination – and how when we are aware we can all make the right choice. In The One Minute Manager, Ken Blanchard and Spencer Johnson have great theories that work well with a multigenerational audience; One Minute Goals, One Minute Praisings, and One Minute Reprimands. Even though it’s been around for over 20 years this book is still relevant. In Rework Jason Fried and David Heinemeier Hansson give us the updated approach to work, work/life balance, innovation and reward. It’s not really a time management book – but one that looks at all aspects of business and innovation and explores how to do it differently / better in our current environment. I hope you enjoy my perspective of the best time management books. Please note I am not (unfortunately), being paid to support / review any of these books. Also, all proprietary images and names are copyright and owned by someone – not me. I would be remiss if I also didn’t mention Do More Great Work by Michael Bungay Stanier and The 4-hour Work Week by Tim Ferriss. Happy communicating and Time Management. Nash’s Game Theory has intrigued me of late. I like how although it is often used in economics, Nash’s Game Theory can be applied to everyday situations including how people can make engaged and thoughtful businesses decisions. That said, this theory wasn’t all 100% Nash’s. Using a technology term, Nash “upgraded” an existing theory proposed by von Neumann and Morgenstern. Von Neumann and Morgenstern proposed that the best decisions is when individuals approached decision-making as a zero-sum theory, or (in my interpretation), if I win you have to lose. The concept is that if we as individuals all work at winning, in the long run we will all do better. Thankfully, most real-life situations are not usually zero-sum so this theory often falls short. Nash saw a better way to make decisions by pushing the zero-sum theory closer to altruism (again in my interpretation), altruism being an ethical philosophy in which the happiness of the greatest number of people within the society is accepted as the greatest good (source business dictionary). Nash believed that the best solution is when we consider what is best for the individual (zero-sum), AND the group. I agree that zero-sum is a poor way to run a company or a department. Considering that when one person wins and the majority lose is disheartening. From the point of view of a business leader, my belief (and there are many general studies that support this), is that if work is a zero-sum game, it destroys collaborative team dynamics, individual motivation, costs go up, production & quality goes down and soon employment turnover goes up. But Nash’s theory provides a simple mathematical equation for modeling any number of competitive situations. Nash’s equilibrium as it is sometimes called, offers the idea that a best response equilibrium exists. Again, from the point of view of a business leader, consider it a theory that guides us to use empathy and our listening skills to prioritize our actions so that we can make decisions that serve our purpose and do the best to support others impacted. Those impacted can represent our co-workers, clients, investors or even the environment. If you let me take a leap of faith, in the HR world we can better support the collaborative idea of individual and team benefit by using elements of psychologist Fredrick Herzbers Motivation – Hygiene theory as guides to what benefits the company (ROI because it is important and what almost all decisions include), AND the greater good. How many times do you make decisions also considering the impact those decisions make on Herzberg’s 5 Factors for Satisfaction? If you don’t, you may be making decisions that have short-term gain but long-term negative impact on productivity, employee engagement, quality, customer satisfaction and employment turnover… all things that are very expensive costs for the organization. Staying with the idea of HR, motivation and job satisfaction, one of Nash’s truisms is that even when working toward the greater good, there is often more than one best response. This was an early criticism of Nash’s theory, but one that I think we should celebrate. Why? Because choice and change are exciting. Because our personal and professional needs, goals, likes and dislikes are different which means that within a collaborative team where each person giving their unique best, there will be many ways for the team to meet their goal. If one person was taken away from or added to the team – the team would still find a great solution… but it would likely be a bit different. The long and the short of it (that sounds like my dad speaking), is that if the purpose of economic theories is to predict which one (single), outcome will occur, Nash’s methodology doesn’t help. But, what it does do is give us space to explore options where we try to find a solution where we all win. This Time Management Quiz may be just what you need to help you focus on your priorities. At 15 questions, this time management quiz will only take you a minute or two to complete. It’s a snapshot of the time management questions I’ve designed when I customize time management training and quiz’s for clients. Time management is about what you do with the time you have – and how you feel. Do you feel good about what you accomplish – or stressed? Are you inspired, engaged and enjoying your time at work and with family/ friends – or are you not quite there? This time management quiz will help you evaluate your priorities and best of all, it will help you immediately identify any areas of your time management where you need assistance. Before you do one more thing, take this short time management quiz and see how you are doing. 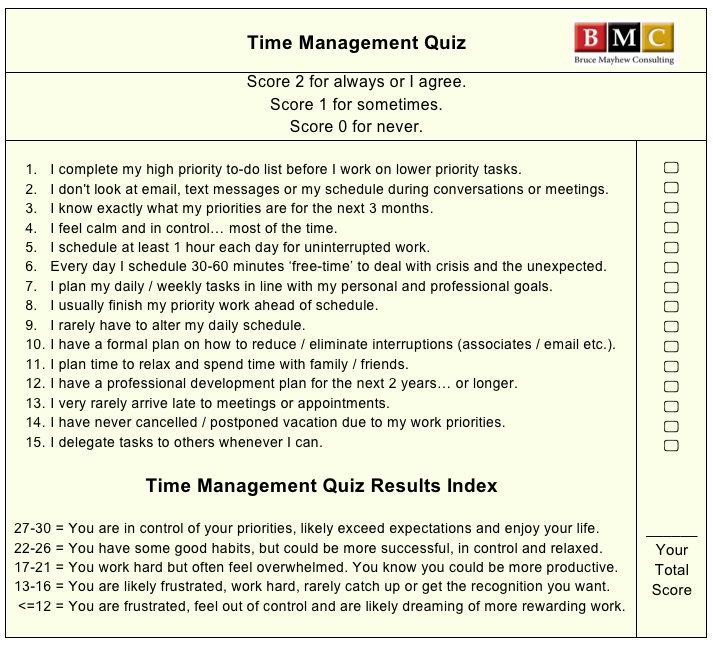 Time Management Quiz by Time Management Facilitator, Bruce Mayhew Consulting. Thank you for taking our time Management Quiz. Do you feel there is no way for you to be both productive at work and fulfilled in your personal life? Especially now since you took this time management quiz, do you want to make sure things change for the better? You may be ready for time management training. Time management is less about bad behaviour as it is about habits we learn from others. So in time management training we learn how and why we can form new habits – better habits. For example: Do your coworkers expect you to drop everything to help them with their work when they ask? Time management training shows you how and why you can stay focused on your important work and still be helpful. Our goal at Bruce Mayhew Consulting is to provide you support to improve your time management and by extension your productivity, success and happiness. 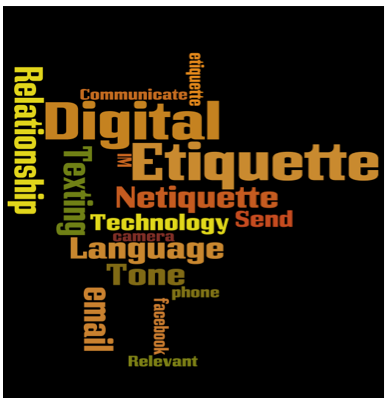 We have many blog posts on this topic as well as other business etiquette topics like Managing Difficult Conversations, Working With 4 Generations, Email Etiquette and Leadership Development. Happy Time Management and business etiquette.